In the earlier pAsuram it was mentioned that those who have desire for mOksham (SrIvaikuNtam) and who have knowledge [about emperumAn] will praise his divine feet and recite his divine names. Why is there such a compulsion? It is because the people mentioned here are those with knowledge. AzhwAr says in this pAsuram that since there is no target for knowledge other than emperumAn, the consort of thirumagaL (SrI mahAlakshmi), only he can be praised. peyarum karum kadalE nOkkum ARu – if it is a river, it will be flowing fully and will flow only towards ocean which keeps throwing out waves. Rivers do not flow towards oceans to fill them, but because they cannot remain without joining oceans. oN pU uyarum kadhiravanE nOkkum – beautiful lotus flower will not blossom without looking at sun, however far sun may be. It will not blossom by looking at any other entity. Even if hot embers are placed next to it, the lotus will not blossom. uyirum dharumanaiyE nOkkum – most of the AthmAs will be under the control of only yama, the lord of righteousness. Other than SrIvaishNavas, whom even yama will avoid going nearby saying “they are not under my control”, all the others are under his control. oN thAmaraiyAL kELvan oruvanaiyE nOkkum uNarvu – in the same way, knowledge will be devoted only to the consort of thirumagaL (SrI mahalakshmi). 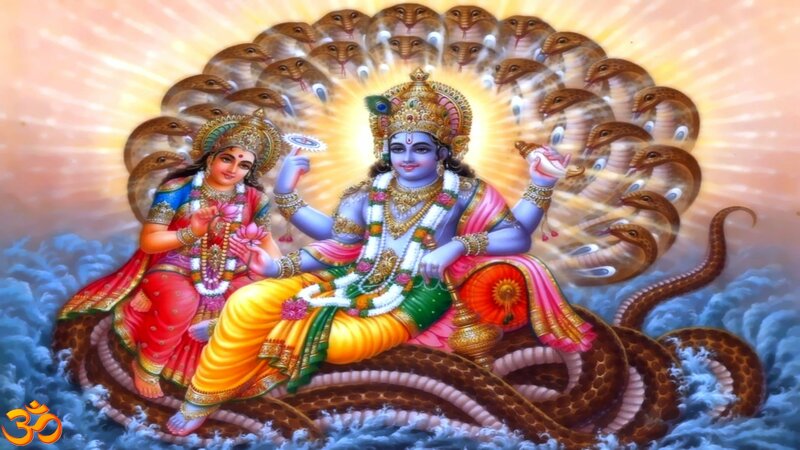 SrIvishNu purANam 6-5-87 says “samgyAyathE yEna thadhasdhOsham Sudhdham param nirmalamEkarUpam, sandhruSyathE vA’pyathi gamyathE vA thath gyAnamagyAna mathO’nya dhuktham”(that knowledge with which the faultless, pure, incomparable supreme entity is known, seen and attained, that alone is gyAnam (knowledge). All the rest are agyAnam (ignorance)). For the lotus called AthmA, emperumAn and pirAtti are the sun and its rays which blossom the knowledge. Usage of the emphatic syllable “E” (oruvanaiyE) implies that AthmA does not have sustenance without emperumAn. AthmA is inseparable from emperumAn’s divine feet like the lines and shadow of the feet. We shall move on to the 68th pAsuram next. This entry was posted in iyaRpA, mudhal thiruvandhAdhi on August 16, 2017 by T N Krishnan.